If you are looking for an affordable solution to replace several missing teeth, partial dentures may be right for you. 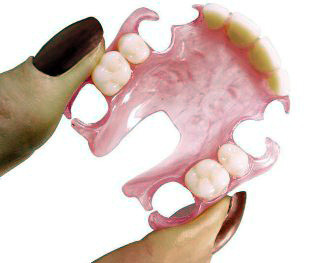 A partial denture is removable and is made to resemble your natural teeth and gums using pink acrylic. It can vary in complexity and durability. The most durable framework is made out of metal. You can see this shown in the image to the right. The appliance is made to fit the unique contours of your teeth and jawbone. It will clasp securely in place to your teeth. Dental implants are the best solution to replace missing teeth. They are permanent and are the most natural-looking solution. They function just like your normal teeth and prevent facial collapse. Please visit our dental implants page to learn more about this option. We recognize that dental implants are expensive and know that all of our patients may not be able to afford them. Snap-on dentures offer many of the same benefits and they are about half the cost. To learn more, please visit our affordable dental implants page. 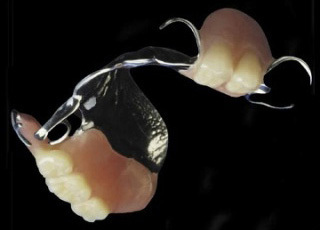 If implants just won’t work with your budget, a removable partial will function well for many years. They will protect your healthy teeth from becoming damaged and will stop them from drifting out of place. Sometimes with a partial denture, there is no hiding the metal clasps. If the clasps will be in a position that they show in your mouth, Valplast offers an aesthetically pleasing option. It is made of a flexible, semi-translucent material that blends in much better with your gums. From a conversational distance, it will be difficult for others to know that you are wearing replacement teeth. In order to get the most out of your partial denture appliance, be sure to keep it clean. Removing it after meals for cleaning will help maximize it’s life and help prevent harmful tooth decay.